Car parking sensor with 4 sensors, and a LED display with proximity notification giving you a low cost rear parking sensor device solution for your vehicle. This car parking sensor will help prevent costly insurance claims against you or damage to your car whilst reversing and parking. Even if there is an out of sight low wall or child behind your vehicle, then this parking sensor will sound an alarm to alert you to stop as well as display the distance between you and the object behind your vehicle, on the color LED display! Coming with 4x ultrasonic parking sensors, all the angles will be covered giving you an reliable distance reading and alarms when you need it most. This car parking sensor is so easy to install that it’ll be ready almost as soon as it’s out the box! Simply plug in all cables into the main box unit, attach the sensors to the rear of your vehicle and you’re done. And if you need to create your own car sensor holes, then this package also features a handy drill bit to drill your own holes in your car. Car parking sensor with 4 sensors, and a LED display with proximity notification giving you a low cost rear parking sensor device solution for your vehicle. This car parking sensor will help prevent costly insurance claims against you or damage to your car whilst reversing and parking. 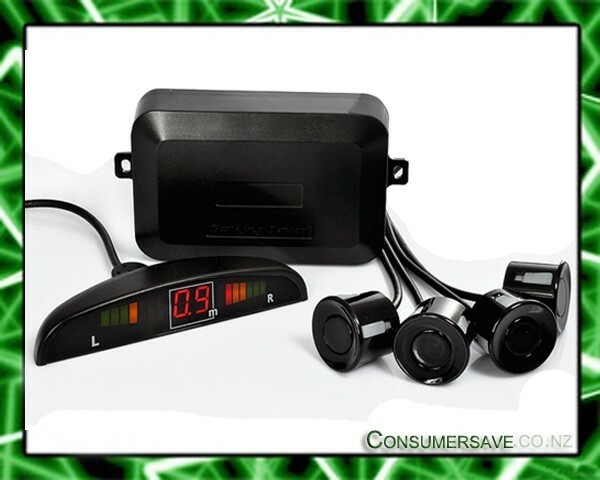 Even if there is an out of sight low wall or child behind your vehicle, then this parking sensor will sound an alarm to alert you to stop as well as display the distance between you and the object behind your vehicle, on the color LED display! Coming with 4x ultrasonic parking sensors, all the angles will be covered giving you an reliable distance reading and alarms when you need it most. This car parking sensor is so easy to install that it’ll be ready almost as soon as it’s out the box! Simply plug in all cables into the main box unit, attach the sensors to the rear of your vehicle and you’re done. And if you need to create your own car sensor holes, then this package also features a handy drill bit to drill your own holes in your car. General Detecting Distance: 0 - 2.5m Ultrasonic Frequency: 40 KHz Sensor Self-Check Function System Alarm Working Temperature: -40 - +80 Degree Celsius Display Working Temperature: -20 - +60 Degree Celsius Power Source: Car Battery Rated Current: 20 - 200mA Rated Voltage: 12V Operation Voltage Range: 9 - 16V Dimensions Main Unit Dimensions: 89x59x22mm(L X W X D) Main unit Weight: 57g LED Display Dimensions: 98x25x25mm(L X W X D) LED Display Weight: 20g Package Contents Car Sensor Kit LCD Display 4x Parking Sensors Drill Bit Sticky Pad User Manual 6 Months Warranty!